Adelia is a Christian mother with four children. She is educated as an engineer but now works as a housekeeper. Her husband left her and the children. When she broke her leg, she had to be off work for two months. Big Family helped Grace Center provide food for Adelia and her children. Big Family Mission has been partnering with the Grace Center in St. Petersburg for over three years now. For me (Ken) it has been a big blessing and a humbling experience as we watch God’s work through Grace Center unfold. Ask Dianne: She will tell you that I want to explain everything in a logical manner. Yes, I want to say the Grace Center does “this, and this, and this”. It has these goals: 1, 2, 3, 4, etc. But, praise God! There is nothing logical about the Amazing Grace that God provides to each of us. And, in similar fashion, we have found that the work and love extended by the Grace Center cannot be reduced to a simple formula. and assisted with the many other acts of grace that flow from the aptly named Grace Center. We thank all of you who pray and contribute to help with the work of the Grace Center. Please consider joining with us to share in the Amazing Grace work of the Grace Center in the year ahead! On our online donation page, you will find options for giving online (or through regular mail) using credit card, direct debit from your checking account, or personal check. If you would like your gift to be used for ministry at the Grace Center, just note that when you give. Thank you! The young lady in this photo (Uliana) is near and dear to our hearts. We first met Uliana when she was nine years old and an orphan at the Kommunar Internat School. 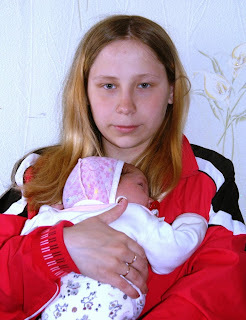 At age 16, Uliana became pregnant and had to drop out of the orphanage school at Jukki. 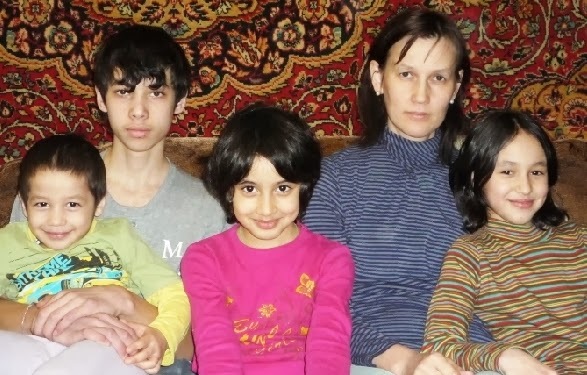 Uliana has had a faithful Big Family sponsor who has prayed much for her over the years. The Grace Center worked with Uliana to help her decide not to have an abortion. Now she has her baby girl Alina, and Alina’s father has married Uliana. She participates in the program for young mothers at the Grace Center. Lena from Grace Center helps Lisa shop for baby clothing. God’s grace flowed to Lisa through a generous gift by one of our Big Family friends.